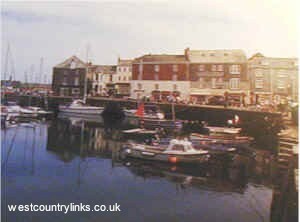 Padstow is an old fishing harbour with wonderful views beaches and walks. Before the advent of the railway, Padstow was the premier port on the North Cornwall coast, but the gradual silting up of the River Camel led to its decline. Today it is a popular holiday resort. Highlight of the Calendar comes on May Day with the 'obby 'oss festivities in a ritual that began in pagan times, the heathen god, represented by an 'oss, is led through the streets by the teaser and followed by dancers in white. Events: ‘Obby ‘Oss day, Carnival, Fish & Ships Festival. Trerice, Newquay Zoo, Prideaux Place — beautiful Elizabethan Mansion House set in 60 acres, Padstow Museum, Camel Trail. St.Georges Well is the nearest beach to Padstow and has good sand at high water. Ten minutes on is Harbour Cove you will find sand at lower states of the tide. The sand is fine and gently shelves with plenty of room for beach games at low tide. Padstow has good facilities as well as boat trips.